Comments: When revealed at the 2008 International Toy Fair in New York City, Hasbro's Cloverfield Monster turned many heads. In a surprising move, the toy maker decided to sell this piece exclusively through their HasbroToyShop.com online store, and it sold out quickly. In the years after, this figure became a big-ticket item selling for over $400 on the secondary market. 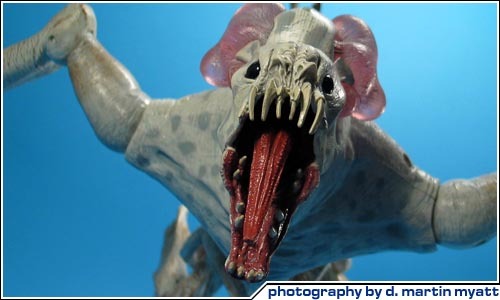 On April 29th, 2011, Online retailers Entertainment Earth announced that there was a warehouse find of a limited number of this sought after collectible, and they were able to secure the entire quantity, giving collectors a much needed second chance at getting the Cloverfield Monster at a decent price. The Cloverfield Monster Signature Series figure stands 14” tall and features an electronic roaring sound, two interchangeable heads, ten mini-monster parasites, and the Statue Of Liberty’s mangled head. In a stroke of design genius, Hasbro added a special compartment in the normal head that allows collectors to store both Liberty’s head and all ten parasites.